Dozens Arrested as Keystone XL Protests Erupt Across the U.S. This article is re-posted from Tar Sands Blockade. One month after the largest climate rally in U.S. history urging President Obama to deny the permit for the Keystone XL pipeline’s northern segment, protesters in dozens of cities throughout the U.S. are confronting Keystone XL’s corporate backers directly. Thirty-seven have been arrested over the last 10 days for disrupting business as usual at TransCanada and their investors’ offices, with more actions planned over the next couple of days. 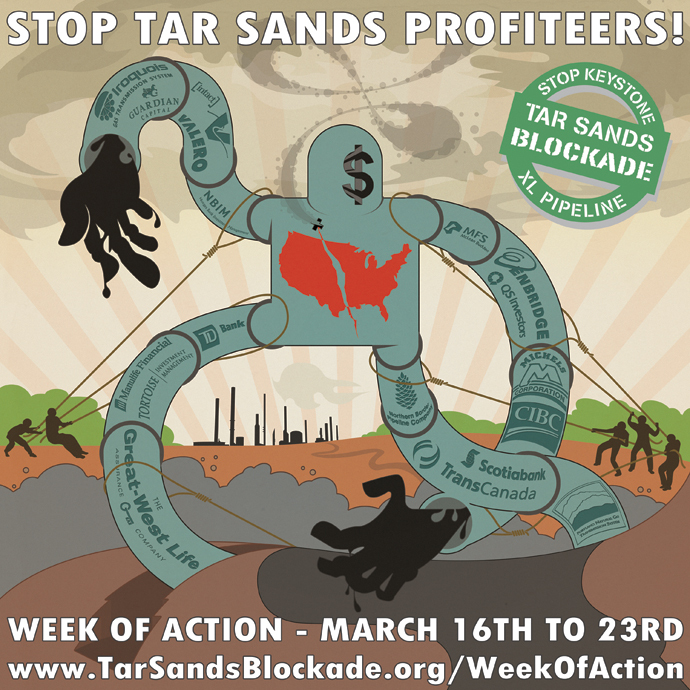 The March 16-23 Week of Action to Stop Tar Sands Profiteers, in solidarity with Great Plains Tar Sands Resistance’s Direct Action Camp in Ponca City, Oklahoma, is endorsed by more than 50 grassroots environmental organizations around the country. Organizers seek to expose green-washed corporations like TD Bank, a top shareholder in TransCanada, and force them to divest from the controversial Keystone XL tar sands pipeline. Religiously and spiritually rooted Americans of all traditions gathered yesterday at the White House to make clear to President Obama that addressing climate change is a moral imperative and that delivering on his inspired State of the Union pledge will require bold actions, including rejecting the Keystone XL tar sands pipeline. Further, Interfaith Moral Action on Climate Change urges President Obama to lead Americans away from reliance on the dirty fossils fuels that drive climate change and transition us to a renewable energy economy. The risk of inaction is so great that some Interfaith Moral Action on Climate Change members felt morally compelled to engage in peaceful civil disobedience, leading to their arrest.